Fantastic, well decorated, comfortable, modern 1 bedroom apartment conveniently located 5 minutes walk away from Liverpool Street Station and smack bang in the centre of everything. 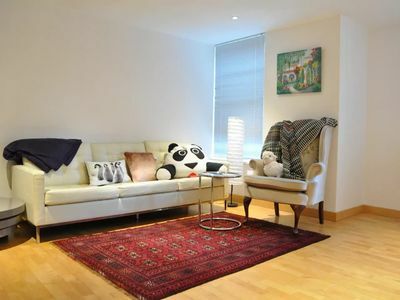 The apartment is very well laid out, spacious and fully equipped with everything you need for a short or long stay in London. There is a king sized bed in the bedroom and our cleaners place fresh, hotel quality linen on the bed just before your arrival. The kitchen has everything you need for a home cooked meal and there is a comfy couch and a dining table in the lounge. The bathroom is clean, spacious and modern and has a shower over the bath. There are plenty of restaurants, cafe's & bars surrounding the apartment and transport links are absolutely fantastic with Liverpool Street Station offering Underground services as well as mainland trains.